Wyndham Rewards returns an average of 16.7% from room night spending as reward stay value in the third annual CarTrawler Hotel Reward Payback Survey. That’s 3+ points higher than the brand’s 2016 result and a 211% higher return than the reward value provided by Starwood’s SPG, which was ranked last among the six hotel loyalty programs at 5.4% for reward payback. 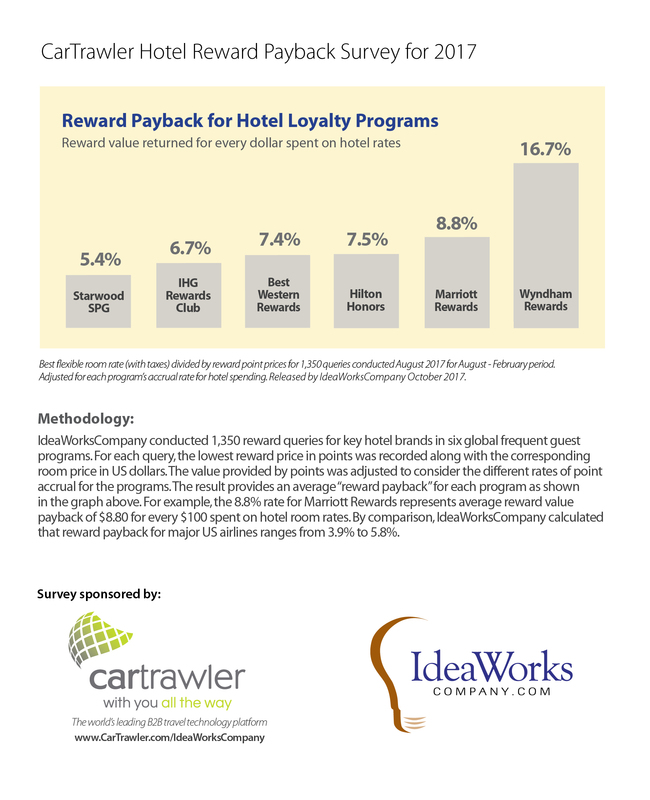 During August 2017, IdeaWorksCompany conducted 1,350 reward queries and calculated “reward payback” for key hotel brands in six global frequent guest programs: Best Western Rewards, Hilton Honors, IHG Rewards Club, Marriott Rewards, Starwood SPG, and Wyndham Rewards. Click here to view the 10-page report. IdeaWorksCompany researched financial filings made by 138 airlines all over the world, discovering 66 which disclosed qualifying revenue activity. Airlines joining the list for 2017 include Azul, Eurowings, Jejuair, Jet Airways, South African, and Vietjet. Now available free online, the 110-page, 2017 Yearbook provides a detailed global review of a proven revenue source that delivers a whopping $6.2 billion for United Airlines, 39.4% of sales for Wizz Air, and $49.89 per passenger carried by Spirit Airlines. 2017 CarTrawler Reward Seat Availability Survey also finds that Delta SkyMiles reward prices are 19% lower than in 2013. Low-cost carriers Southwest and JetBlue continue to offer US flyers the lowest average reward seat pricing, despite an industry shift to dollar-based rather than mileage-based loyalty points accrual. The annual rankings for the two airlines remain unchanged since 2013 when average reward seat pricing was first calculated. CarTrawler-sponsored analysis shows big jump from five years ago, when the same group of airlines generated 10% to 33% from ancillary revenue. 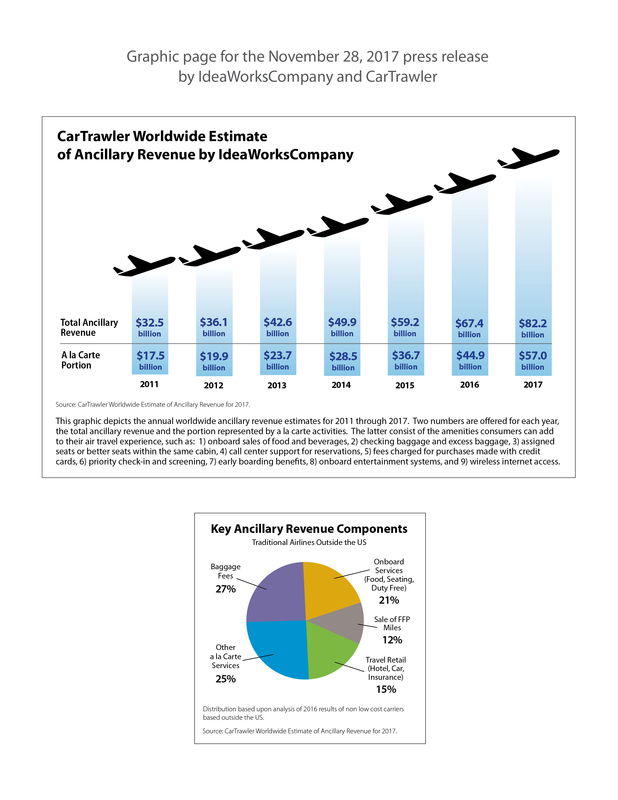 Every year IdeaWorksCompany searches for disclosures of financial results which qualify as ancillary revenue for airlines all over the globe. Annual reports, investor presentations, financial press releases, and quotes attributed to senior executives all qualify as sources in the data collection process. The four largest programs in the world now use revenue based accrual. Learn why American, Delta, Southwest, and United have embraced this new world order. The addition of mileage-earning credit cards forced the airlines to better consider the financial implications. More than 35 years later, revenue now influences every aspect of a frequent flyer program. This report assesses how frequent flyer programs have become very revenue aware in the distribution of miles, points, and rewards to their members. IdeaWorksCompany finds Air France, Emirates, Indigo, and Ryanair provide great mobile retailing examples. The latest report from IdeaWorksCompany applies the rise of the mobile age to the ancillary revenue revolution. IdeaWorksCompany researched the in-path booking capabilities of the mobile applications offered by the world’s largest 25 airlines. It’s a varied list which includes traditional global network airlines and eight low cost carriers. IdeaWorksCompany continues a year-end tradition by identifying the airlines that have shown the greatest prowess in ancillary revenue, a la carte pricing, and loyalty marketing. This year, Kuwait-based Jazeera Airways takes the top spot. Throughout 2016, we assessed the top ancillary revenue producing airlines and the most generous frequent flier programs; our reports described the industry’s service and product innovations; and we offered practical advice for airline executives. Along the way, a select group of five airlines clearly stood apart in their quest for new sources of revenue success.